This function block closes a port that is provided by connecting a "RS232 to USB" adapter. It supports a maximum of 25 interfaces (see table). 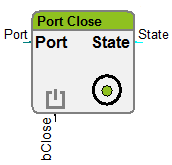 It is recommended to connect the input "bClose" with an edge-triggered function block. The output "State" shows the current state.